Audiences can hear Marie Robertson on June 23, as she will perform a free concert at Jule Collins Smith Museum of Fine Art, Auburn University as a part of the museum’s weekly series, “Museum After Hours.” Collars Improvisational Rotation will open for her from 5-6, and Robertson will play until 8. 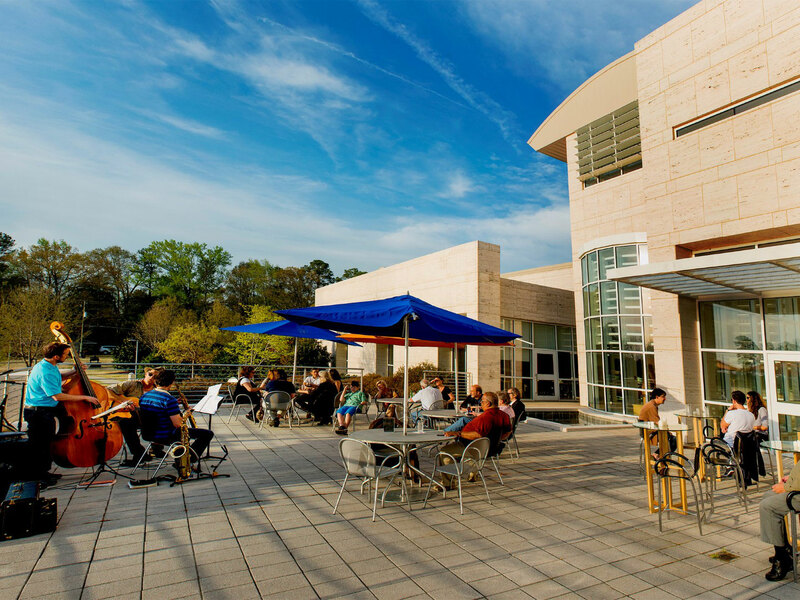 The Museum Café is open from 5 to 8 pm on Thursdays. The music can sometimes be heard inside the café, or visitors can dine before or after the concerts. Admission to the fine art exhibitions is free courtesy of JCSM Business Partners. A suggested donation of $5 is appreciated. 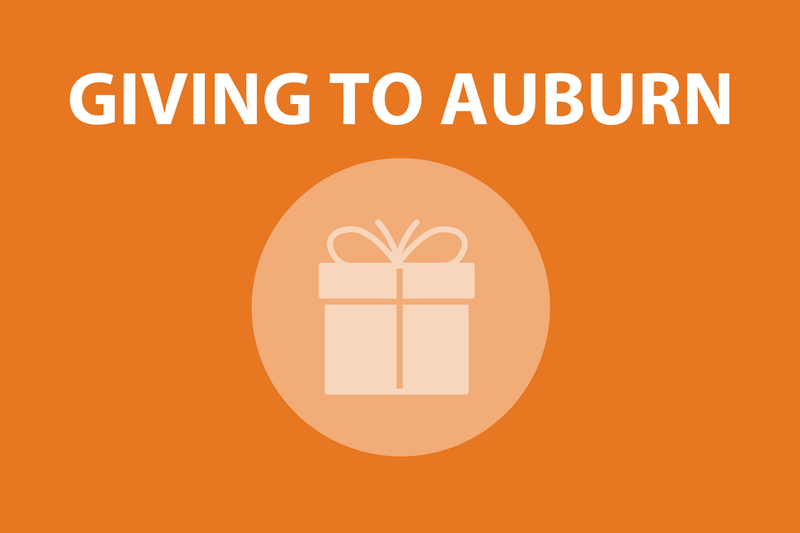 For more information, visit jcsm.auburn.edu or call 334-844-1484. Marie Robertson currently resides in her hometown Auburn, AL where she works diligently to stay active in Auburn’s music community. She is an Applied Brass Instructor at Huntingdon College in Montgomery, AL and also teaches Middle School and High School brass lessons in the Auburn/Opelika area. Robertson began pursuing her music career in Auburn and received a Bachelor of Arts in Music from Auburn University in 2009. 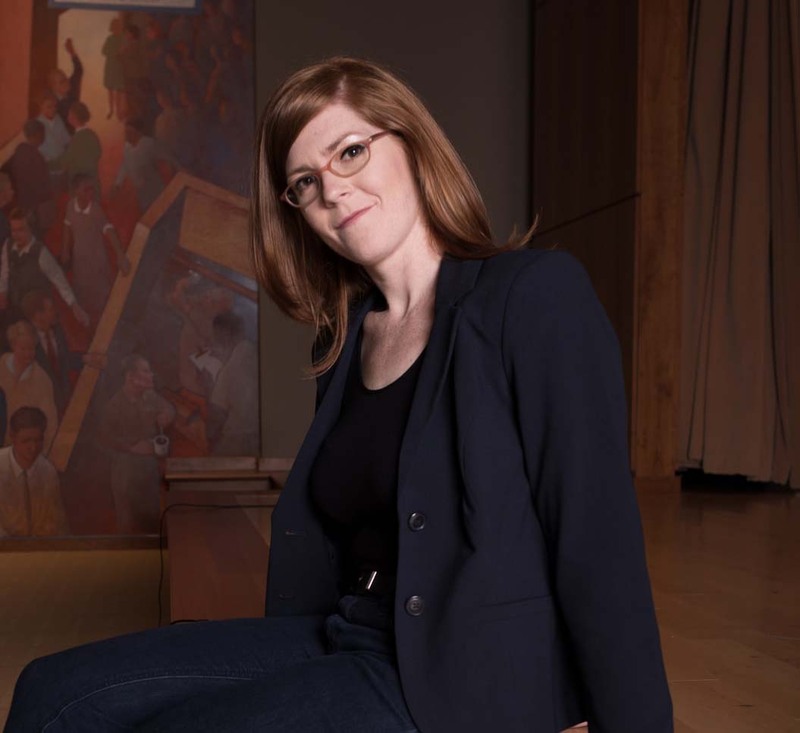 She then went on to pursue a Master of Music in Euphonium Performance from the University of Colorado at Boulder, where she spent three years immersing herself in the Boulder-Denver music scenes. Robertson has dedicated many of her musical talents to her passion as a singer/songwriter and keyboard player. She began studying classical piano as her first instrument when she was eight years old but it wasn’t until her early twenties that she began writing songs for piano and voice. Since then, she has had the opportunity to collaborate, perform, and record with many groups in Denver, Atlanta, and Auburn, AL as a singer/songwriter, keyboardist, and trombone and euphonium player. She has helped release two full-length albums and a number of EP’s and singles. Robertson continues to collaborate with musicians throughout the Southeast and is also working towards her own solo career as a singer, songwriter and performer. 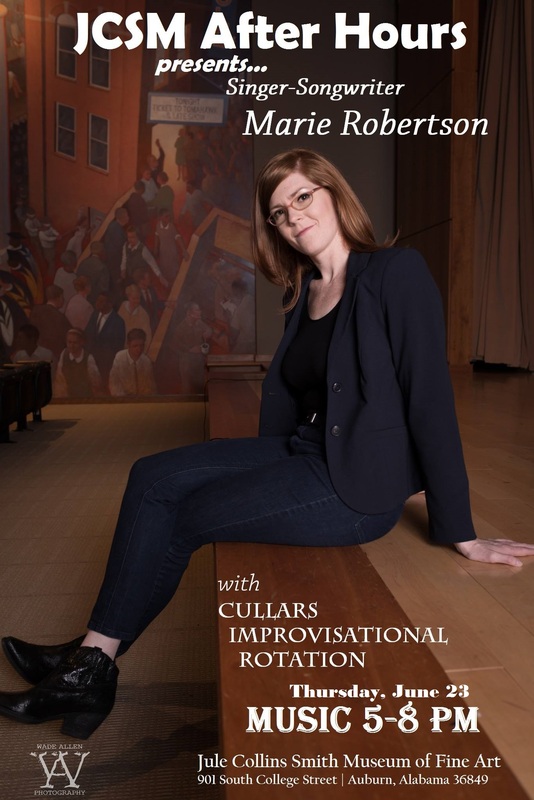 Audiences can hear Cullars Improvisational Rotation on Thursday nights from 5 to 8 pm at the Jule Collins Smith Museum of Fine Art, Auburn University. Information on guest lineups will be posted online. 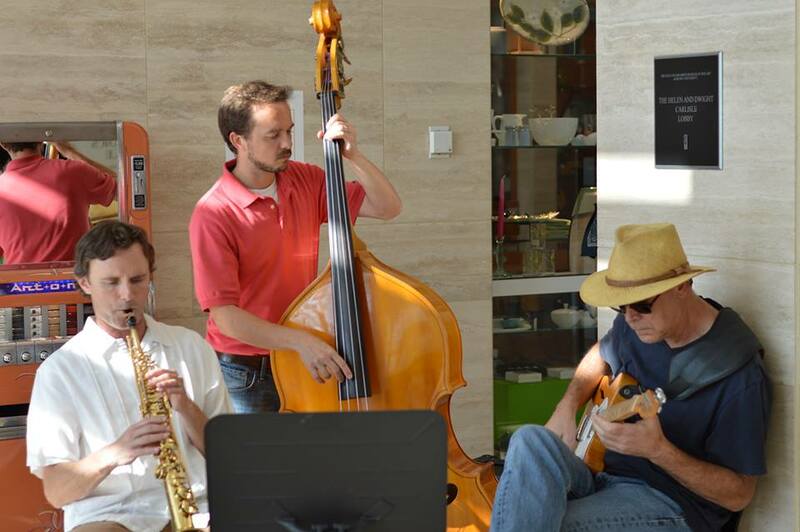 Made up of Dan Mackowski (guitars), Patrick McCurry (woodwinds), and Jason DeBlanc (basses), Cullars Improvisational Rotation is a jazz trio with a southern sensibility: thoughtful, ambient, and adventurous. Named after the oldest soil fertility study in the South, the group embraces its roots and promotes new growth through delicately rehearsed arrangements of standards, originals, hymns and improvisations. Cafe service is available with food and drink by Ursula’s Catering. Meet one of the vendors of our Museum Homecoming Tailgate on Friday, October 2! Chicken Salad Chick will have food available for purchase from 3 to 7 pm as we celebrate the opening of Out of the Box: A Juried Outdoor Sculpture Exhibition. The community-wide event is open to all ages, and will include sculpture tours, art and family activities, a tiger bounce house for kids, a grand prize giveaway, and delicious food and beverage options from local favorites (including Chicken Salad Chick!). Cash is preferred, we ID. No outside food or drinks allowed. 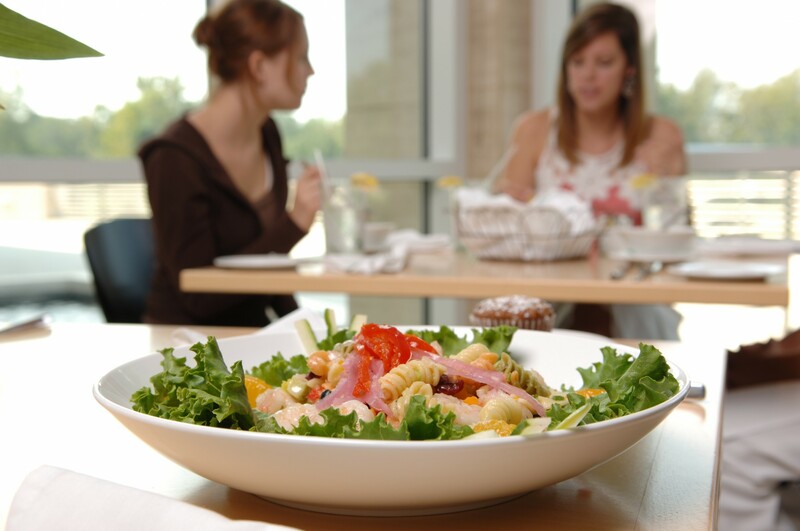 “I have always been on my own personal quest to find the perfect chicken salad. 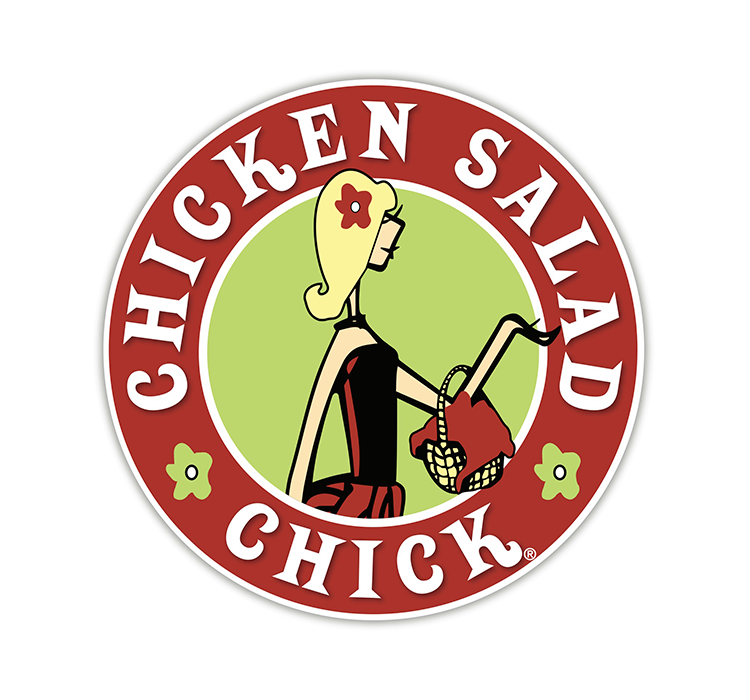 Every restaurant I entered, I would order the chicken salad sandwich. The funny thing about chicken salad is that everyone’s idea of the “perfect” one is so completely different, although we all pretty much agree that chicken and mayonnaise are the two key components. So, after tasting every chicken salad I came across, I realized everyone’s idea of the perfect recipe is different. I began working on my original recipe at home and taste testing on my cooperative and wonderful neighbors. They were kind enough to give me honest feedback as I kept tweaking. I finally arrived with a recipe where the consensus was that “this was IT.” Thanks to my neighbors and the teachers at Ogletree Elementary School, within three weeks I had more business than I could handle. I then formed a partnership with Kevin Brown, my future husband, who had shared this vision with me from the beginning. He had the experience and business sense to turn a recipe into a restaurant. 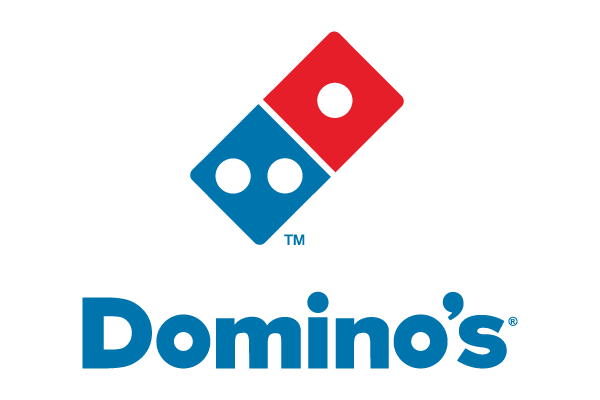 So business was booming, word was spreading, the idea of a restaurant was growing and Ring! “Stacy?…” “Yes?” “This is Stan from Lee County Health Department…. Where are you cooking your chicken?” “In my kitchen Stan… is that a problem?” “Yes… that is illegal. You cannot cook anything in your home and sell it.” “Thanks Stan.” So we put a halt to everything. Our customers were outraged and some tried to get some smuggled anyway. Jeffrey Tucker, the vice president of the Ludwig von Mises Institute and a customer of mine, wrote in blog titled “The Chicken Salad Chick Shut Down,” saying “This girl has been shut down, not because she is a threat to our health, but because she is a threat to competition!” He also went on to say, “It’s a classic case of suburban food hysteria.” Thank you, Jeffrey. Thank you also to the anonymous caller who turned me into the health department. You really lit the fire under Kevin to turn this idea into a restaurant sooner than ever! Since that day, he has worked tirelessly to turn this dream of ours into a reality. This has truly been a collaborative effort by neighbors keeping my children so I could work, by friends painting artwork on the restaurant walls, friends offering professional services free of charge and my family’s undying support. Thank you everyone and especially Kevin….Thank you for never giving up. We did it! Meet one of the vendors of our Museum Homecoming Tailgate on Friday, October 2! Niffer’s Place will have food available for purchase from 3 to 7 pm as we celebrate the opening of Out of the Box: A Juried Outdoor Sculpture Exhibition. The community-wide event is open to all ages, and will include sculpture tours, art and family activities, a tiger bounce house for kids, and delicious food and beverage options from local favorites (including Niffer’s Place!). Cash is preferred, we ID. No outside food or drinks allowed. 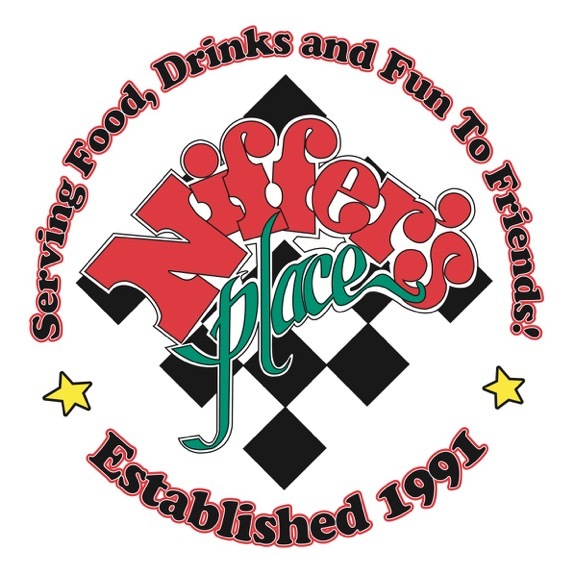 “Niffer’s Place opened in 1991 with the concept of good food for an excellent value in a fun atmosphere. 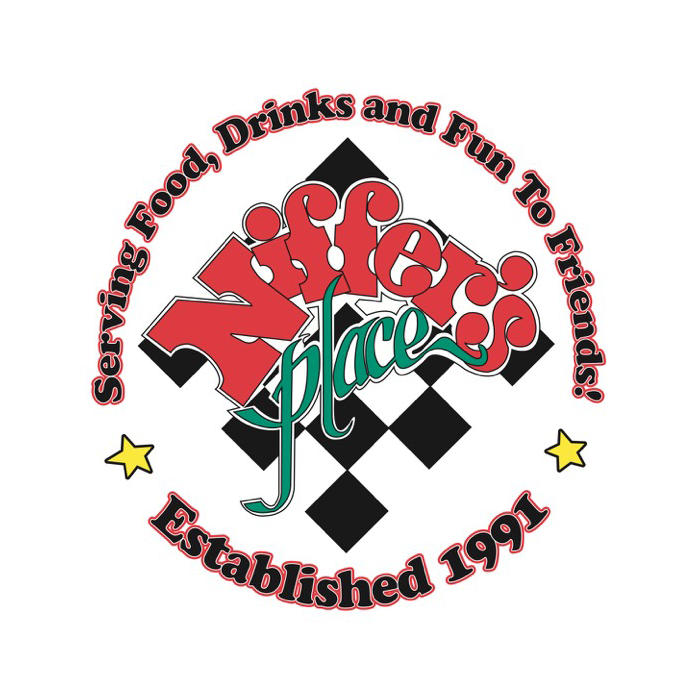 Keely Beasecker, Auburn University alumni and AU swim alumni has owned Niffer’s Place since founding in 1991. She has surrounded herself with the best team in the business. We are dedicated to providing our customers with excellent customer service, great food and hopefully a fun experience on each visit! Keely loves to hear that people enjoy the food and the friendly service, but the thing she loves to hear most is that people have FUN here! The character of Niffer, whom you see on our sign and on our menu, is a regular guy with regular food at regular prices, who wants you to EAT HERE! Over the years, specials like our Burger Night, Wing Night, Beer Specials, and Wednesday Kids Eat Free have drawn many loyal customers. Fun begins with the many unusual decorations, colorful chalkboards and continues with a magician/balloon artist making his rounds at the tables, a play area for the kids and live music on occasion. 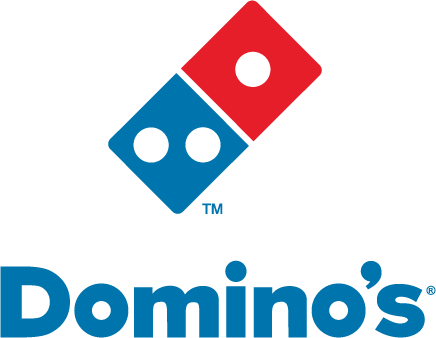 Our employees are the reason we have such good food, and friendly service and we don’t forget it. They are immortalized at Niffer’s by the fish hanging from, well, everywhere. Each employee has the opportunity to decorate and hang their very own fish in the restaurant to commemorate the part they have played in making Niffer’s something special. Niffer’s menu began with a wide variety of items to choose from and still has the same variety, but MORE! We have something for everyone from wings, nachos, huge salads, ½ pound burgers, grilled chicken with steamed veggies, pasta, vegetarian dishes, kid’s menu, desserts, and more! The secret to our Great food is that our hamburger meat is never frozen, hand pattied and seasoned with our own special recipe. Our chicken is fresh and marinated making a juicy consistent product. Our Niffer baked beans is a family recipe made fresh right here. Our homemade potato chips are cut, fried and seasoned by our in-house chip expert. The mexicalli dip/dressing is made fresh daily. And we believe you can taste the difference!